Your bot has been invited to the paid group? Not a problem now. We’ve changed the way your bots replies to paid group invitations (sent by other residents to the bot). Previously, there were two ways: (a) you stopped your bot from accepting any requests or (b) you allow your bot to accept invitations. 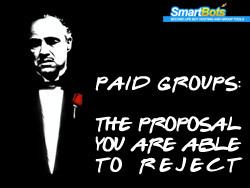 Thus, if you allow your bot to accept an invitation, the bot was accepting paid groups too. Bot sends IM to the inviter, asking to give it the money to join the group. After receiving the required amount of money (within a single payment) bot joins the group. This does not affect bot owner inviting the bot into a group – bot accepts your invitation even if “Accept group invitations” option is off. This measure protects your bot even if you forget to turn off the “Accept group invitations” option in the Bot Control Panel. You don’t need to do anything, bots are powered with this new function already.